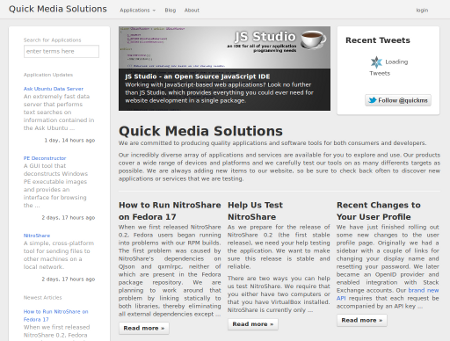 Quick Media Solutions is my personal website where most of the web services and tools I have written reside. I recently rewrote the entire website in Python (using the Django framework) in order to organize things better and make it easier to add new services. The site fully integrates with the Stack Exchange API - after creating an account on the site, you can authorize the site to access your Stack Exchange account. The services currently provided include an RSS feed of your inbox, an RSS feed for notifications, and an inbox sidebar that lets you comment directly from the page using the new write access introduced with v2.1 of the API. Quick Media Solutions is closed source. Browse other questions tagged app website python .